A friend shared your site with me a few days ago and I've been in seventh heaven ever since. I spent about 4 and a half hours this morning playing with a couple of your ideas from videos and the brown trifold is what I came up with. The choice was made because I had some brown and beige flowers that I wanted to use. I used half a sheet of 8 1/2 x 11 cardstock in a light beige. I used a punch on the dark brown cardstock to make my 2 edgings. The brown circles I trimmed down just an 1/8th of an inch all the way around. 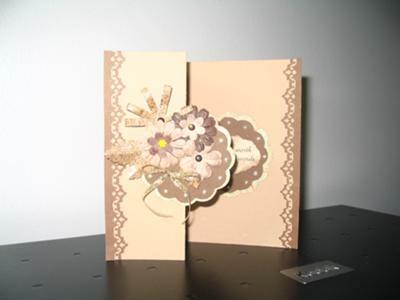 I also used strips of paper in a mottled brown to make a flower and leaves. I used brads to hold all the flowers together and small half pearls in ivory on the exposed scallops of the circles. I started by positioning the edgings and fastening them. Then the 2 paisley circles were put into place. The brown circle on front was put on using 3-d risers. Then I positioned the flowers and leaves, added a gold bow and the pearls. On the inside I did the paisley layer, then the brown. I cut my saying with fancy scissors and used brown ink to do the edges and smudge it just a little. Pearls were added on the inside scallops. I don't have a person I wish to send the card to as yet but am sure I'll find a friend who I want to remember. I've been making cards for approximately 5 years and fall farther in love with the craft with every new thing I learn. I enjoy learning all different methods of making cards. This card is such a pretty one and is sure to "Wow" anybody that gets it. It can be used for any occasion and made in any colour but I do like the borwn design that you have done here Linda ... it is lovely. There are both written instructions and a video version using Spellbinders for you to see so whichever you want to try you will find all the steps there. When this card popped onto the screen, it literally took my breath and WOW came from my mouth. What a beauty, I just love clean simple but beautiful cards and this is definately one! A lovely card. I like the color scheme, I think people tend to shy away when thinking of brown as its such a dark bland color on its own. But you have managed to transform it into something beautiful. I know the person who receives it is going to be very pleased. What a lovely card and the colours complement each so well. I, like you, think Christina's site is marvellous, I've learned so much since I started visiting.